Rated by The Sunday Times as one of the ‘Ten Best Walks in the World’, the Lycian Way in Turkey follows 300 miles of ancient trails and mule roads that linked the region before the coming of the car. We follow some of its very best stretches, averaging about 5-6 miles walking a day, with a traditional gulet ever present offshore, providing elegant transport, dining and accommodation. We’ll stroll along Roman roads, retrace the route of a 2,000 year old aqueduct, and follow in the footsteps of characters from Alexander the Great to modern day shepherds. On foot we will be able to discover many of the remote archaeological sites, like Sidyma, an ancient town perched in the hills that encompasses a modern day tiny farming village. We’ll walk the magnificent opening section of the Lycian Way, with wonderful views in all directions, visit the ghost town of Kaya, abandoned by the Greeks after the exchange of populations in 1923 (the centrepiece of Louis de Bernières’ novel, Birds Without Wings); and discover Kekova, one of the most romantic and picturesque areas on the Turkish coast. More often than not we’ll be the only people exploring the historic ruins on our journey. From footpaths by the coast, to goat tracks high up in the hills, this is an archaeological tour and gulet cruise packed full of breath-taking panoramas. Average rating 5 out of 5 from 372 reviews for Walking and Cruising Western Lycia, according to AITO reviews. Day 1: Our gulet is about 30 minutes from Dalaman airport at Göcek, a pretty harbour beneath mountains at the head of the Bay of Fethiye, on Turkey’s Mediterranean coast. Welcome dinner aboard. Day 2: We set out eastwards. Our first walk is from Faralya to Kabak through beautiful woodland and with wondrous views out across the mountains of Lycia to the sea. Day 3: We drive inland to the impressive ancient ruins of Sidyma, a 2,500 year old Lycian city that surrounds a modern farming village. We walk down from the ancient site, enjoy a delicious picnic, then back to our gulet for a swim. Day 4: We cruise by Kekova Island, then stroll through the pretty village of Üçağız and its ancient Lycian burial grounds to the Ottoman castle at Kale. One of the most romantic stops of the holiday. Day 5: A wondrous walk retracing the route of the Roman aqueduct to the grandiose ruins of ancient Patara. A sunset dip offers a refreshing finale. Overnight in the pretty harbour at Kalkan. Day 6: A glorious trek from Ovacık across the shoulder of Babadaĝ (Father Mountain) to Faralya. Breath-taking vistas all day long culminating with a view from on high down into Butterfly Valley. Day 7: West to explore the ghost town of Levissi/Kaya, abandoned by its Greek inhabitants in 1923. Walk back to the gulet near Gemiler Island, an area perfect for swimming, before cruising to the harbour of Fethiye. Booking Flights If you are staying in or connecting via Istanbul then the easiest way to get to and from the gulet is to fly. There are a number of airlines that offer domestic flights in Turkey such as Turkish Airlines. 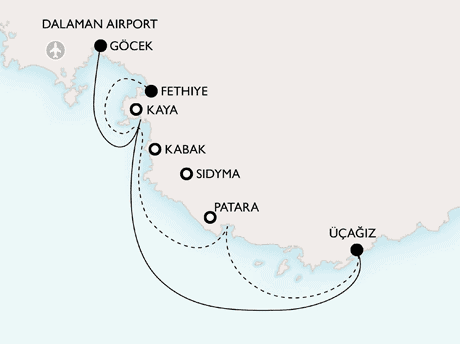 Turkish Airlines has a wide selection of flights on these days and there are alternative flights to and from Istanbul with some of Turkey’s low cost airlines such as Atlas Jet, and Onur Air. The cheapest way to book flights is directly with the airline online. Visas Visas are easily obtained online at eVisa and must be purchased before you travel. Further information about the Walking Unlike our standard gulet cruises, there is a significant amount of walking on our Walking and Cruising Western Lycia tour in Turkey. We believe that’s a key part of its appeal. The walks we do are for the most part sections of The Lycian Way, Turkey’s first national footpath, and widely regarded as one of the best hiking trails in the world for its combination of stunning vistas, scenery, and the archaeological sites that litter the way. Please be aware that the terrain is often uneven, rocky, and rugged, and a number of the paths are carpeted with loose stones underfoot. You do need to be fit with a good sense of balance. There are some long stretches of uphill and downhill walking. It’s certainly not a walk in the park, but ropes and crampons aren’t required! You do need to be used to hiking off the beaten track. The trip is designed to ease you in gently, with a few shorter walks and site visits, with some longer walks later in the tour. Across the week, the average distance is about 5-6 miles a day (an average of about 2/3 hours in addition to any site visits), but it’s not really the distance that you need to bear in mind, but the terrain. We take all the walks at a leisurely pace, with some wonderful sites and great swims thrown in for good measure. The trip includes a full day’s walking along the slopes of Father Mountain, involving a significant amount of uphill walking, a hike of about 6 hours with a super picnic, plenty of snack and drink stops and stupendous views along the way. Of course the beauty of being on the gulet, means that it’s perfectly possible for guests to skip a day’s walk if they so wish, and simply relax on the boat. If you fancy putting your feet up and resting for a day, that is perfectly possible. So if you wish to lie back and read a book or have an extra swim, you can. Istanbul If you are planning to stay in Istanbul before or after your gulet tour we have included below links to more information and things to see and do. Custom Tours If you are thinking of extending your trip to Turkey to include visits to Cappadocia, Ephesus, Istanbul or further afield, please contact our office for further information.